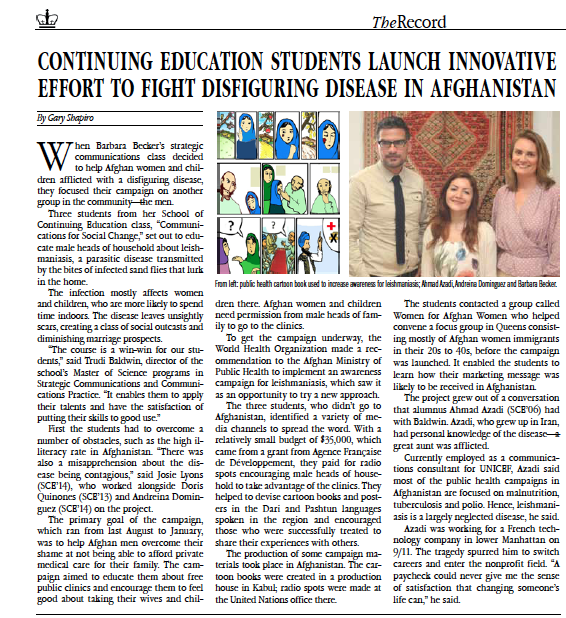 When Barbara Becker’s strategic communications class decided to help Afghan women and children afflicted with a disfiguring disease, they focused their campaign on another group in the community—the men. Three students from her School of Continuing Education class, “Communications for Social Change,” set out to educate male heads of household about leishmaniasis, a parasitic disease transmitted by the bites of infected sand flies that lurk in the home. The infection mostly affects women and children, who are more likely to spend time indoors. The disease leaves unsightly scars, creating a class of social outcasts and diminishing marriage prospects. First the students had to overcome a number of obstacles, such as the high illiteracy rate in Afghanistan. “There was also a misapprehension about the disease being contagious,” said Josie Lyons (SCE’14), who worked alongside Doris Quinones (SCE’13) and Andreina Dominguez (SCE’14) on the project. The primary goal of the campaign, which ran from last August to January, was to help Afghan men overcome their shame at not being able to afford private medical care for their family. The campaign aimed to educate them about free public clinics and encourage them to feel good about taking their wives and children there. Afghan women and children need permission from male heads of family to go to the clinics. To get the campaign underway, the World Health Organization made a recommendation to the Afghan Ministry of Public Health to implement an awareness campaign for leishmaniasis, which saw it as an opportunity to try a new approach. The three students, who didn’t go to Afghanistan, identified a variety of media channels to spread the word. With a relatively small budget of $35,000, which came from a grant from Agence Française de Développement, they paid for radio spots encouraging male heads of household to take advantage of the clinics. They helped to devise cartoon books and posters in the Dari and Pashtun languages spoken in the region and encouraged those who were successfully treated to share their experiences with others. The production of some campaign materials took place in Afghanistan. The cartoon books were created in a production house in Kabul; radio spots were made at the United Nations office there. The students contacted a group called Women for Afghan Women who helped convene a focus group in Queens consisting mostly of Afghan women immigrants in their 20s to 40s, before the campaign was launched. It enabled the students to learn how their marketing message was likely to be received in Afghanistan. The project grew out of a conversation that alumnus Ahmad Azadi (SCE’06) had with Baldwin. Azadi, who grew up in Iran, had personal knowledge of the disease—a great aunt was afflicted. Currently employed as a communications consultant for UNICEF, Azadi said most of the public health campaigns in Afghanistan are focused on malnutrition, tuberculosis and polio. Hence, leishmaniasis is a largely neglected disease, he said. Azadi was working for a French technology company in lower Manhattan on 9/11. The tragedy spurred him to switch careers and enter the nonprofit field. “A paycheck could never give me the sense of satisfaction that changing someone’s life can,” he said.